Writing is cathartic. Whether the story or characters you create are based on truth, putting thoughts to paper allows release. In July House by Pat D. Robinson, writing plays an integral part to the plot. The story follows five friends who hang out at the family house of focal friend Guthrie. The night of debauchery leads to truths coming out including buddy Jack revealing he has won a grant named in honor of Guthrie's late mother. By winning, he now gets to write a play that will be produced. This play he intended to write includes friends writing letters to each other that can only be read after one dies. But rather than write this play, Jack decides he wants to write a play about Guthrie's mom. And this is not a "your mom" joke. This sets Guthrie off and decides the group should write these notes that now have no barring to Jack's play. As time passes, Guthrie disobeys the rules, reads the notes, and uses them as inspiration for his own theatrical masterpiece. The play that Robinson has crafted is interesting. But between the calling attention to the note device and the gun that is prevalently placed on stage, Robinson leaves little mystery as to what is to come. You can’t have mystery when it’s all spelled out for you. When the audience is ahead of the story, it may mean checking out of the play, something you never want to happen. Robinson gives great weight to Guthrie’s mother. She plays an integral role to nearly every character in the piece. Yet the audience only gets to hear about her making it hard to care about her prominence. Robinson has the characters spew off a lot of facts about her humanitarian past and work in Africa in such a short span, it’s hard to keep up with an unseen character in addition to characters we’ve just only met. 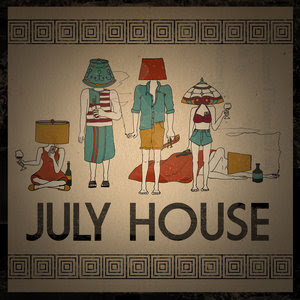 July House is very much a relationship play. And one key relationship Robinson wants to highlight is between Jack and Guthrie. We see them briefly alone in the second scene of the play but if the bond between Jack and Guthrie is so important for the end, Robinson needs to beef it up. Make them even tighter. Thick as thieves as they say. July House is an ensemble piece with one core character, Guthrie. This is truly Guthrie’s journey on his road to destruction. Despite it being six years after the death of his mother, it seems as if it is only now that he has begun to grieve. And his grief comes in the form of jealousy. As Guthrie, Nick Winthrop Lawson played him erratic. It was a very bold choice. But compared to his four costars, it felt as if he was in a completely different play. As best friend Jack, Josh Tobin shined as the friend with a good head on his shoulders. He genuinely cared for his declining friend and wanted what was best for him. The standout actor in the company was Jack Utrata as Paul. Utrata did something well. You wanted to be best friends with Paul and Utrata. Utrata was a natural on stage, bringing quick wit and charm. Director Nathaniel Claridad keyed into the relationships of this world. He made sure that not only did the characters like each other but the ensemble did as well. It looked like everyone was really having a blast on stage. Claridad and scenic designer Ran Xia had a very interesting use of space with a very eclectic array of scenic elements. Sure, the festival may be to blame, but their was no cohesion with the furniture. They weren’t believable as a unit. Additionally, the rope aspect was a smart choice to define walls but the bundled mess was not attractive. In a play about darkness and light, the scrim was killer. Lighting designer Justin Hart utilized the color aspect of the back wall but there was so much need for there to be little to no light on stage sans the practical lamps when they were present. July House has some storytelling problems. It’s not that the story isn’t interesting, it’s the way that it unfolds that’s not captivating. And it all comes down to the playwriting element Robinson employs. With so much attention given to the good idea of the device, it almost lost all credibility. With some script clean ups, July House could be something special.